Last night the atmosphere was particularly clear and steady here, so I took the opportunity to image some of my favourite lunar craters. All of the images below were captured using a Meade 203mm aperture Schmidt-Cassegrain telescope and a Philips SPC900NC webcam. I also used a red (Wratten #23A) filter in front of the webcam to filter out some of the wavelengths of light that are more detrimentally affected by atmospheric undulations. The images below are all mosaics. Each mosaic pane was made by taking a short video with the webcam and then sifting out the best 250 frames to be stacked and processed together into one more detailed image. Then each of the panes are arranged together to create the final mosaic image you see below. 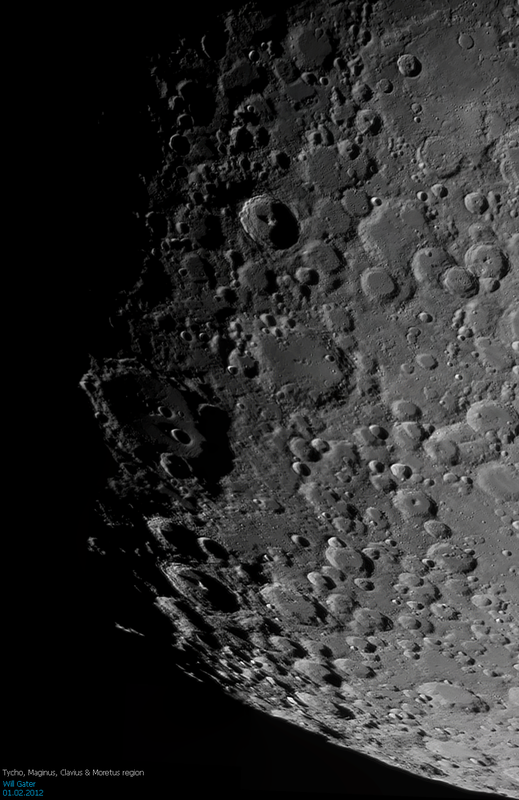 For example, the Clavius & Tycho image was made by stitching together 16 individual panes.